story by liz pacheco | photo by charles bartholemewPillars of Sustainability: GRID recognizes that sustainability isn’t a new phenomenon. In recognition of our forebears, we will, from time to time, profile local people and institutions who’ve laid the foundation of the region’s sustainable infrastructure. Don’t drive too fast by the Kimberton Whole Foods; you’re likely to miss it. Housed in a brick building with white painted windows and a green awning, the store is unassuming—nothing like the unrelated name-sharers from Austin, Texas. If not for the shopping carts outside, you might not even realize it’s a food store. But, the best part of this independent natural foods store is inside, essentially Mecca for natural foods enthusiasts. Vibrant organic fruits and vegetables (many are local) overflow the produce bins, and the back wall is a shrine to all things dairy, with cold cases holding local butters, yogurts, eggs and milk. There are fresh baked breads, locally ground coffees and an entire section dedicated to handmade crafts and body care products. It’s hard to believe that 25 years ago the space was a hardware store. Of course, 25 years ago, the idea of a natural foods store wasn’t popular. The Austin-based Whole Foods chain was in its infancy, and the organic foods movement had yet to gain any mainstream appeal. Then, in 1986, Phoenixville, Pa., saw the arrival of its first natural foods store, the Seven Stars Farm Store—today’s Kimberton Whole Foods. 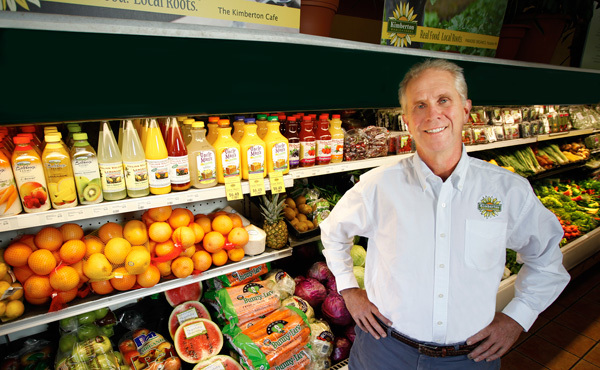 Much has changed in the natural foods world since 1986, but Kimberton Whole Foods has remained a community staple. While Kimberton has expanded to multiple locations, the company is still independently owned (no relation to the Austin-based chain) and its mission is unchanged: to provide customers with fresh foods that support organic and biodynamic farming, local production and a healthy lifestyle. “[It’s] the hub of our conscious community,” explains Jeff Bradbury, a Kimberton employee. When Kimberton’s owner, Terry Brett, moved to Eastern Pennsylvania in the 1970s with his wife, Patricia, he had one goal: organic farming. However, starting a farm and a family simultaneously wasn’t ideal. Instead, the couple moved to a home on a 120-acre dairy farm, and Terry started working as a truck driver for local company Nelson’s Ice Cream. Seven years as a truck driver and four children later, Terry decided it was time for a career change. A friendship with a local farmer working at the Kimberton Waldorf School led to jobs for Terry and Patricia making and selling yogurt for the school’s organic dairy in a new venture: the Seven Stars Farm Store. “The [Waldorf farm] was losing so much money selling into the conventional milk pool,” says Brett. The decision to open a natural foods store, instead of a conventional corner store, seemed obvious, since the dairy was already organic and biodynamic. Even better, there was an eager customer-base that wanted a natural foods store with local raw milk, yogurt and other farm products. Producing yogurt proved more profitable than bottling milk, and within two years all milk was going into the yogurt. Soon, yogurt sales expanded, helping the store become self-sufficient and independent of the Waldorf School. By 1994, the store was doing about $1 million a year in business and had outgrown the original space (and insurance policies). The store moved to the hardware store in the village of Kimberton, changing names and leaving Seven Stars Farm as an independent yogurt and dairy. The Bretts have co-owned Kimberton with various partners over the years and today share the business with a silent investor and partner. But in 1994, just as the store moved to Kimberton, the natural foods climate had changed and the Whole Foods concept had taken off. A Fresh Fields store opened nearby, and in 1996 it merged with Whole Foods. While greater sophistication does mean buying from vendors owned by major corporations (i.e., Stonyfield Farms, part of French multinational Groupe Danone), Kimberton has also been able to maintain their community relationships. “[We can] be the marketplace for local products and vendors who may not have access or don’t have the scale to sell to large entities,” says Brett. Kimberton has relationships with about 150 small, local businesses. Their produce is organic and local whenever possible—close to 90 percent during the summer months. They sell raw milk, cookies and bread from the Camphill Village Kimberton Hills Community [see Farm Profile, August 2011] and, of course, Seven Stars Yogurt is abundant on the shelves. The stores feature locally made crafts and body-care products along with homeopathic medicines. And the community support goes beyond what’s sold in the stores. Kimberton sponsors local events and hosts talks, workshops and film screenings. In 2004, another Kimberton location opened in Downingtown, Pa. Three years later a Douglasville store was added, followed by an Upper Bucks County store in Ottsville in 2008. There’s also a café at the flagship location, providing a community gathering place alongside freshly made smoothies, coffees, baked goods and meals. The expansion isn’t over, either. Brett talks about possibilities for stores in Lancaster, Newtown, Emmaus, the West Chester area, even Wilmington or Philadelphia. Of course, new locations depend on what other independent stores already exist in the area. “If they’re taking care of their local community, we don’t want to compete with them,” says Brett. In honor of its 25th anniversary, the flagship location has been getting a facelift. The produce, dairy and apothecary areas are being redesigned, painting is being done and Brett himself has spent some evenings performing tile work. As for the reveling, Kimberton has been doing that all summer. They’re hosting a series of farm tours to celebrate local farmers, and in July, they sponsored a “Shakespeare in the Park” performance by Theatre Horizon’s Young Company of Actors. In September, the flagship store is hosting a local foods dinner and a birthday barbecue. For more information about Kimberton and the anniversary events, visit kimbertonwholefoods.com.